If you’re heading to the Seychelles, the chances are that you are likely planning on heading to the beach. In which case, you might be wondering where the best beaches in the Seychelles are located. 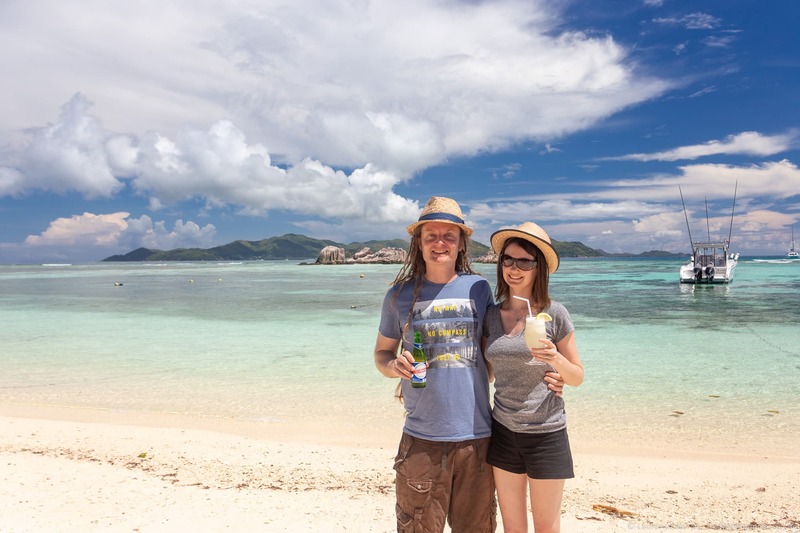 Well, I’m here to help – I was lucky enough to call the Seychelles home for a number of years, and Jess and I recently visited and explored as many Seychelles beaches as we could to help you find the best one for you. To be honest, picking a best beach in the Seychelles is tough, as there are so many to choose from, and the majority of the beaches are pretty perfect, with white sands, gorgeous clean turquoise waters, and palm trees. But of course, there are differences between the beaches, and some of them are definitely a little bit more beautiful than the others. Some are also better for different things, like snorkelling, calm waters – of if you want to have a bit of fun in some waves. Others are harder to get to and require a bit of a hike. Some are more known for sand flies than others, which is something to avoid – sand flies are tiny biting insects that can cause a fairly itchy bump on your skin. Others have gorgeous luxury resorts as a back drop, making it easy to sip a cocktail whilst on the beach. Essentially, there’s something for everyone! So let’s take a look at what we think are the best beaches in the Seychelles. Bonus Seychelles Beach – The hidden beach you discover! Here are our favourite ten beaches in the Seychelles, which we’ve grouped by island, and which cover Mahé, Praslin, and La Digue. These are the three islands with the largest number of inhabitants and the ones most commonly visited by tourists. They are also the islands we include on our one week Seychelles itinerary. 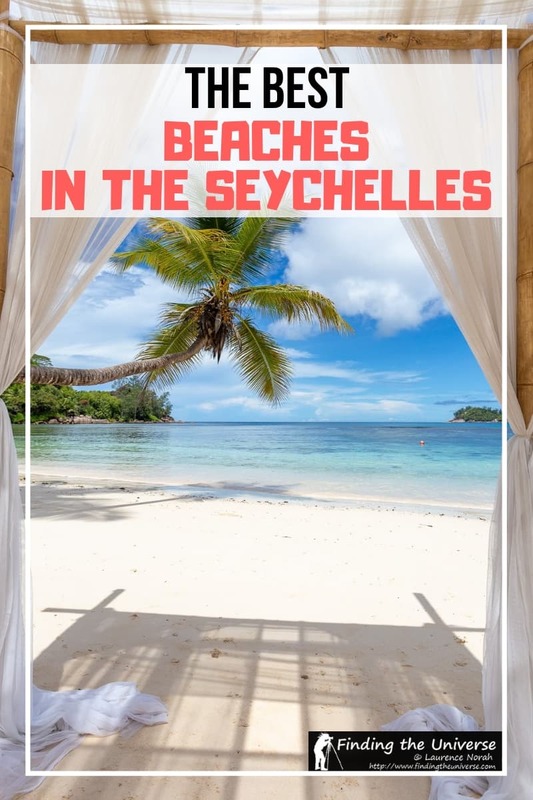 Note that we’ve not included beaches on private islands in this list, as they’re generally a bit harder to get to and are not visited by most visitors to the Seychelles. But if you do have the opportunity, the beaches on islands like Bird Island, Silhouette Island, and North Island are pretty epic too! This is without doubt my favourite beach in the Seychelles, if not the world. It’s also my dad’s favourite beach in the Seychelles. Between us, we have decades of Seychelles beach experience, so you can trust that our opinion is definitely correct, haha! That said, this beach isn’t for everyone. At certain times of year, this beach has very strong waves and there can be strong currents too. So you’ll only want to actually swim here if the conditions are safe, and you feel confident that you know what you are doing. This is a not the most family-friendly beach because of the strong currents and potential steep drop offs, so if you have kids, I’d take them to swim elsewhere. Personally, I find that those bigger waves are part of the fun, and I love that the location of this beach, far at the south end of Mahé Island, makes for a quiet location most of the time. If you visit during the week (outside of holidays), you might even find that you have the beach pretty much to yourself. It is remarkable how quite this beach can be given that there is now a luxury hotel at one end of it Presumably the guests are too busy enjoying their villas, amenities and pool. You can drive here and there’s a parking area (although the road is pretty bad getting here, especially after a good rain! ), take a taxi, or catch the public bus down to right next to the beach and then walk the last bit of the way (about 10 minutes). I wasn’t going to do this list in any particularly order, but ok, Petite Anse is probably my second favourite beach, on Mahé at least. This beach is found on the south west coast of the island, and for the longest time it was a hidden gem, accessible only after a 20 minute hike along a narrow and hard to find path. 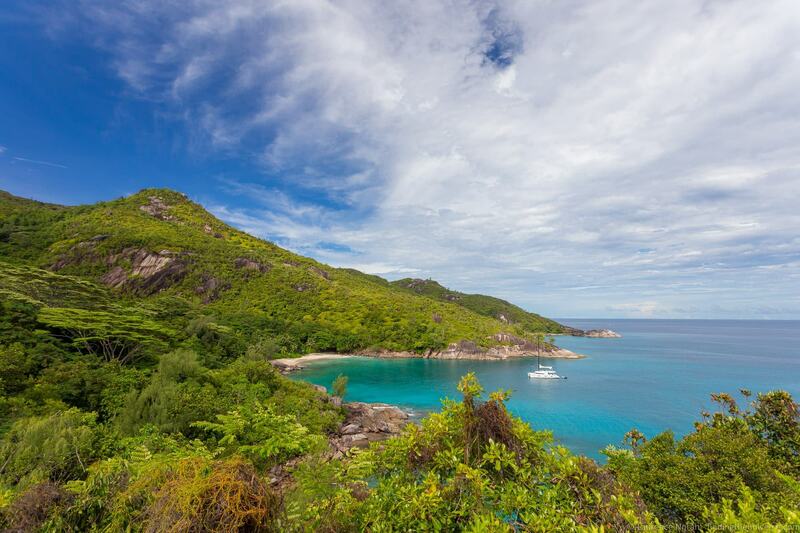 Of course, progress is progress, and inevitably a hotel has now been built in this bay – the Four Seasons Seychelles. I was nervous as to how this would affect the overall vibe, but even I must admit that the hotel is pretty stunning, and access to the beach is now a lot easier. Although of course the beach is a bit busier as a result. Still, the waters are calm, the views are spectacular, and now there’s the added bonus of a hotel bar for drinks and snacks if need one. Which is never a bad thing. Just bear in mind that if you are not a guest of the hotel, you will need to park outside the security gate and walk in. There is limited car parking so getting there early helps, and you will have to register at the security gate before you get access to the beach. The walk from the security gate to the beach takes about 15 to 20 minutes, and it’s all downhill, which is fine on the way to the beach, and a bit of a slog on the way back up! 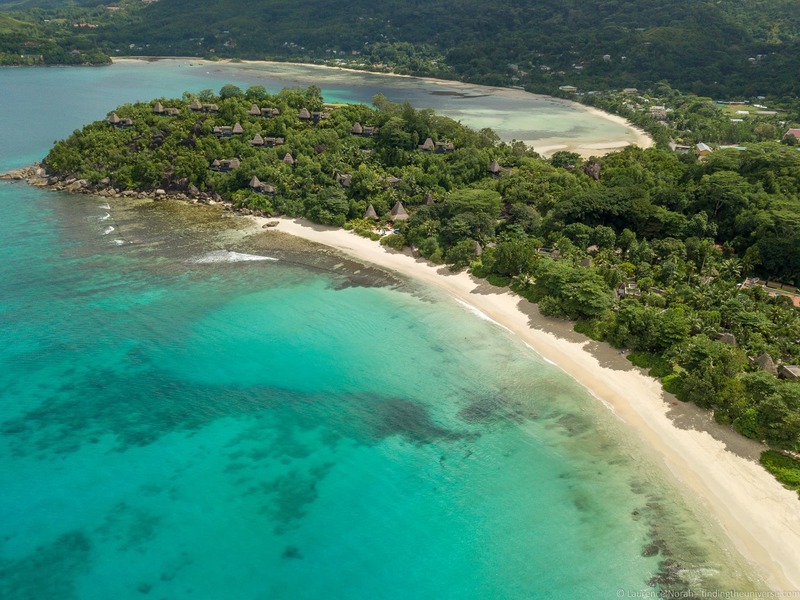 Pretty much every epic beach on Mahé now has a luxury resort sitting on it, and Anse Louis is no exception – the granite hillside above the beach is dotted with the luxury chalets and infinity pools that make up the MAIA Luxury resort. This doesn’t detract from the beach though, which is conveniently located right off the main coast road, and is therefore easy to get to, either with your own car, a taxi, or local bus services. The south end of the beach (near the river and car parking area) is our favourite as the swimming here is the best – as you go further north along the beach it gets a bit rocky. Note, like most beaches on the west coast, Anse Louis does sometimes get seaweed deposited from June to September. Fear not though, there are plenty more beaches on the other coasts if you happen to visit at this time of year! If you like your beach to be a bit challenging to get to, Anse Major (also known as Anse Majore) is the beach for you. Found on the north west coast of the island, there’s no road to Anse Major – instead you have to park up and hike, which will take anywhere between half an hour and an hour, depending on how fast you walk, and how close you are able to park to the trailhead. There is not a lot of parking along the last kilometre of the road, so either arrive early, or plan to hike a bit further – from Bel Ombre (the nearest large town which is where the bus route terminates), it’s around a fifteen minute walk to the trail head. It is also possible to take a boat taxi to and/or from Anse Major, which makes it more accessible – you might want to hike in, and arrange for a boat taxi to come and pick you up. If you pick this option, parking in Bel Ombre or Beau Vallon (or taking the bus) would be the best option. Finally, you can also of course take a normal taxi to the trailhead and hike from here, although you’ll want to arrange to have one come to pick you up as well. The walk is stunning, although we would recommend tackling it early on in the day, ideally starting before 9am, as there are long stretches of unshaded path here, and it gets very hot and humid in the Seychelles as the day goes on. Still, the walk is worth it, as you wend your way along the granitic cliff face, with lovely views in every direction. 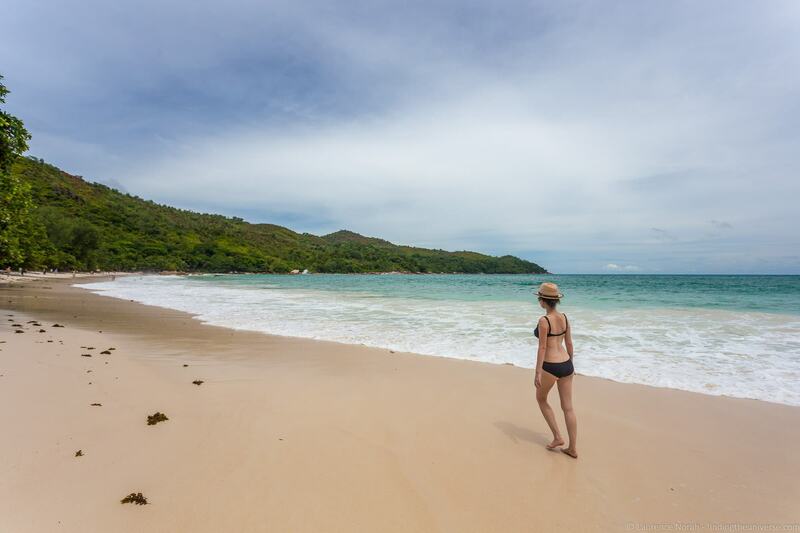 And you are rewarded at the end with the incredible Anse Major, a tucked away cove whose remoteness generally makes for a quieter beach experience. If you enjoy hiking, it’s also possible to continue along the trail past Anse Major all the way to Cap Ternay, from where you can catch a bus back around the island to Beau Vallon. This can also be done as a guided boat tour, which includes both Anse Major and Cap Ternay – check prices and availability for this tour here. Just remember that Anse Major is a well known spot amongst locals, so like many beaches in the Seychelles, do expect it to be busier on the weekends when folks aren’t at work! Beau Vallon Bay is the longest stretch of beach on Mahé, and also the most commercialised, with a number of major hotels to be found along the shore here. That’s not to say you should discount it though. This is still a beautiful beach and one of the safest beaches on the islands for swimming, as the water depth changes very slowly. It’s particularly popular with families given the safe nature of the waters here, and if you have kids, this will likely become your go-to beach if you spend time on Mahé. 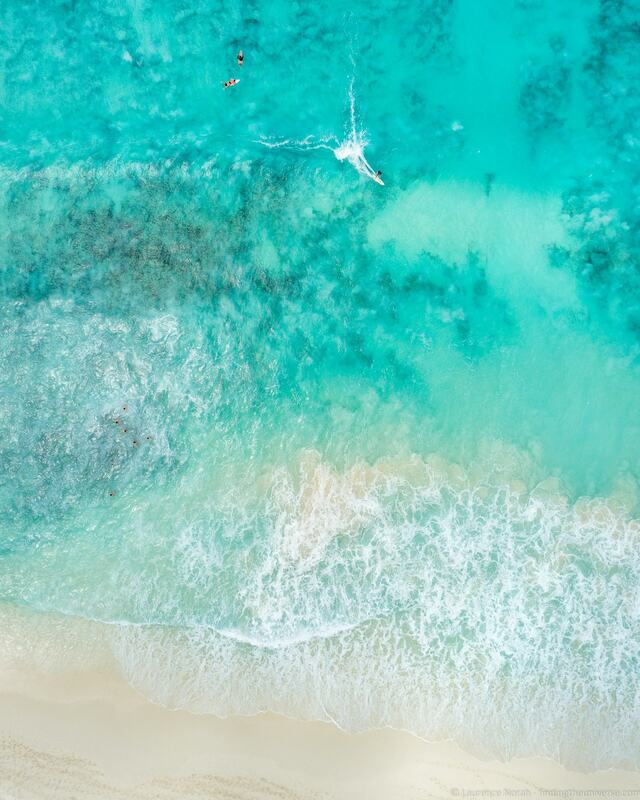 But this large stretch of water is also home to a number of fun water based activities, such as parasailing, banana boats, stand up paddle boarding, snorkelling and more. It’s also the best place in the Seychelles to learn to dive, and also where most diving operators are based. Check out diving tour prices here, and snorkelling options here. 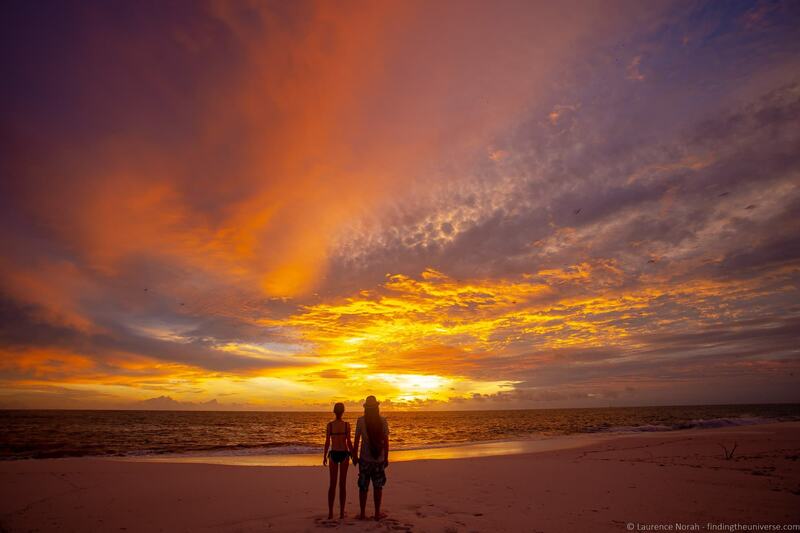 Beau Vallon Bay is also one of the best places to watch the sunset on Mahé. The bay is perfectly located on the west side of the island for the sunset, and Silhouette island sits in the middle of the frame, providing a perfect, well, silhouette. There are also plenty of restaurants and bars along the beach where you can get drinks and try some lovely Seychelles food. Anse Georgette is my favourite beach on Praslin island, although it has become harder to reach in recent years. When I lived on Praslin in the 1990’s, this beach was reached with a 30 minute walk through rather pleasant undeveloped jungle. However, times change, and now there is of course a hotel here – the Constance Lemuria Resort. If you happen to be staying at the Lemuria Resort, this beach is easy to reach, it’s just a short walk or golf cart ride. If you aren’t staying at the Lemuria Resort, it’s a little bit harder. Technically, hotels that are built in the Seychelles that block off access to a public beach have to allow non-guests access to the beach within reason. And every other beach I’ve mentioned in this post does make this relatively easy – usually you just turn up, and if you have to walk across hotel grounds to get to the beach, you just register at the security gate. The Four Seasons on Mahé is an excellent example of how to do this correctly. Lemuria Resort technically obeys the rules, but you can tell they aren’t super excited about having visitors wandering through their grounds. They closely restrict the number of visitors per day, there’s no parking provided, and you need to reserve your beach visit in advance. They also only let you in during certain hours. All of this almost meant I left this beach off my list of favourites, but to be honest, we still enjoyed the beach even with the extra hassle. It’s wonderfully picturesque, with drooping palm trees providing plentiful shade, and there are rocky outcrops on either end of the beach providing a lovely frame. The water is generally fairly calm, although there can be swells, so do be careful before swimming here. You do have a few more options for getting here. There’s a hiking trail that takes you around the outside of the resort, but it takes a little over an hour each way. You can also book a meal at the hotel restaurant, in which case you can drive onto the property. Finally, a number of boat tours around Praslin and other islands make a stop here, such as this one. 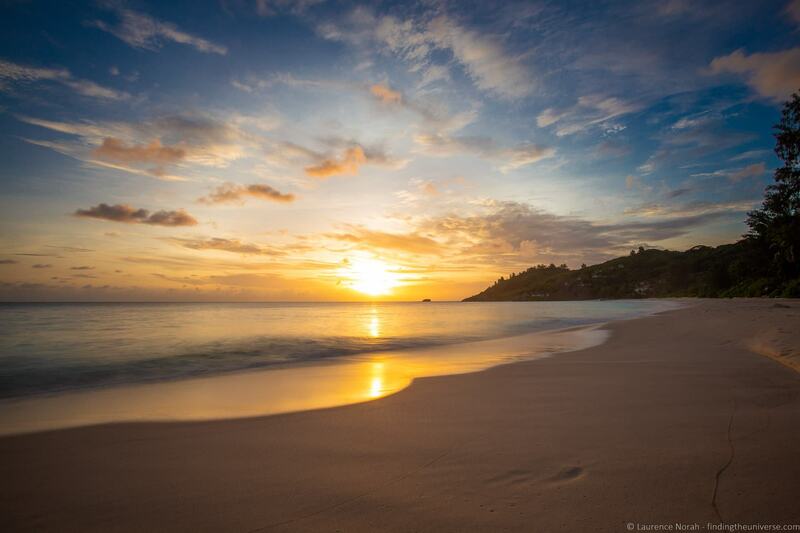 Anse Lazio is widely regarded as one of the most beautiful beaches in the world. To be honest, you could say that about most of the beaches in the Seychelles. Still, when it comes to round up posts, Anse Lazio features highly, and it is certainly worthy of its inclusion in this post. The beach is a long stretch of gorgeous white sand, with safe turquoise water to swim in, and granitic outcrops at either end framing the scene. It’s a relatively large beach, meaning there’s plenty of room for everyone, and there’s also lots of shade to be found here (essential for avoiding sunburn on a full day at the beach!). There’s also an excellent seafood restaurants here, Bon Bon Plume, as well as a guesthouse – Le Chevalier Bay, which also has a restaurant. Anze Lazio is at the end of the road in terms of Praslin, found on the north-east end of the island. To get here from the west side of the island (where the airport is), you have to come all the way around the island, as the road on Praslin doesn’t go all the way around. A hire car is the easiest way to get here, but there’s also a public bus, and many of the hotels on the island also operate shuttles here (usually for a modest fee), as its so popular. That popularity does mean this beach is quite busy compared to the average, but compared to other popular beaches around the world it will still feel rather quiet! We arrived after a rain storm so you can see there weren’t many people here as they scattered during the storm. Grand Anse is the first of three beaches we’re featuring on La Digue – this small island sure does pack a punch when it comes to beaches! Reached by a 15 – 20 minute bike ride (the hill is quite steep, so it can take a bit longer depending on fitness!) or around a 40 – 60 minute hike , this stunning wide stretch of beach is one of the most popular for swimming on the island. It also has a reasonable surf break, so you might see people catching a wave or two. There’s a restaurant here, and if you are feeling so inclined, you can walk a bit further along the coast here to Petite Anse, another gorgeous beach. You can also walk from here to our next beach on the list, if you really want to get away from it all. Whilst many visitors and locals on La Digue flock to Anse Source D’Argent (see below), or Grand Anse (above), we would suggest that the true beach aficionado who is looking to get away from it all might want to head to Anse Cocos instead. 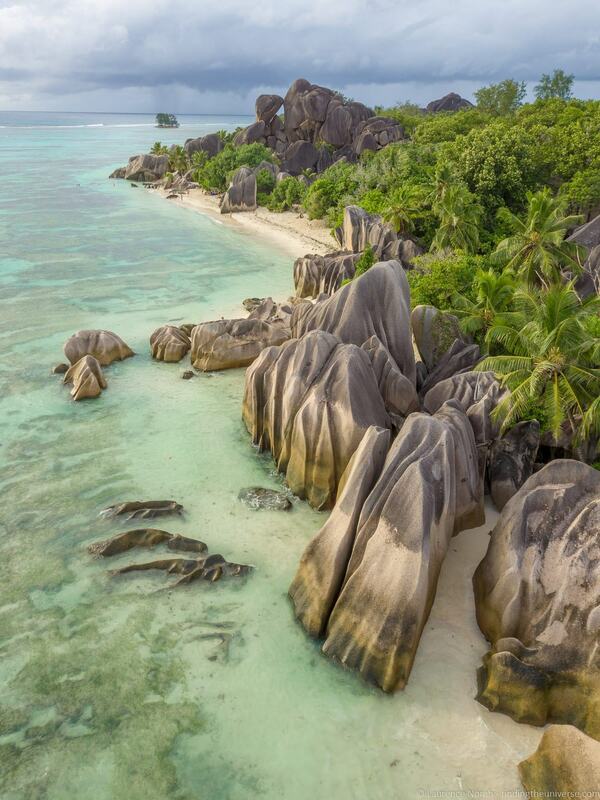 Anse Cocos is definitely not the easiest beach to get to on La Digue – you have to first get to either Grand Anse or Anse Fourmis (around a 15 – 30 minute bike ride from the main town on the island), and then you have to hike for a further 30 – 50 minutes. This effort puts most people off, so you are very likely to have this beach either to yourself, or to only be sharing it with a handful of other brave souls. And what a beach to have to yourself! With gorgeous scenery, white sands, rock formations, and generally calm waters, this is a truly epic beach that is worth the effort! Just make sure to bring plenty of water, snacks, and sun cream, as there are no services or shops here! Also no garbage cans, so be sure to pack in and out any litter. We’re going to end our list of the best beaches in the Seychelles with Anse Source D’Argent, which is a truly unique and absolutely stunning beach. It’s so pretty that multiple commercials have been filmed here, and it is usually cited as the most beautiful beach in the Seychelles, if not the world. Well, it is largely the incredible rock formations here. 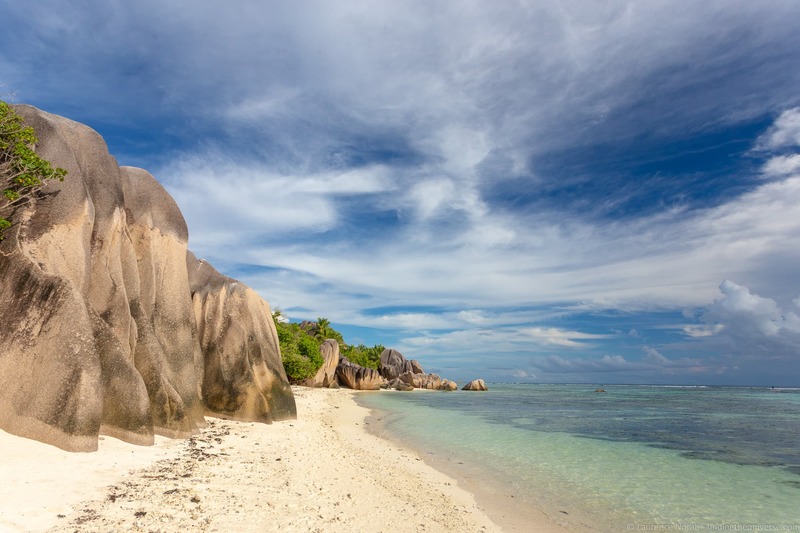 The granitic outcrops on this beach have been sculpted over tens of thousand of years by the actions of rain and sea water, and their haphazard scattering along the beach, which is also dotted with palm and other trees, makes for a gorgeous setting. Add to this the remarkably calm and shallow waters (Anse Source D’Argent is protected by a reef), and this is one of the safest beaches in the Seychelles for swimming and snorkelling. Of course, the popularity of this beach does mean it is fairly crowded. This was by far the most crowded beach we were on in our 2 weeks in the Seychelles earlier this year. La Digue is a very popular relatively low budget island in the Seychelles, so is generally busier than the other islands, and this is the beach everyone wants to come to. So do expect it to be busier than other beaches. If you want to come during a quieter time, come here early in the morning, before the crowds show up. The estate gate normally opens at 7:00am most days. We can also recommend hanging around here for sunset (just be sure to get a ticket before the ticket booth closes – normally at 5:00pm), as the views across the water as the sun sets over Praslin islands are magnificent. One last thing – of all the beaches on this list, Anse Source D’Argent is the only beach you have to pay to visit. This is because access is across the private Union Estate, which has an entry fee (free for locals with Seychelles ID). It’s under $10 USD per person, and the Union Estate is an interesting place to explore, featuring the oldest cemetery in the Seychelles (I have ancestors buried here! ), as well as a plantation home, and various exhibits on things like coprah manufacturing. So in your hurry to reach the beach, don’t miss out on seeing some of the attractions here. Please don’t take this list of our favourite beaches in the Seychelles as the final word! There are so many incredible beaches in the Seychelles, and part of the joy of visiting the islands is finding your own secret piece of paradise. There is always another beach to discover it seems. For instance we’ve never been to Anse Marron and it looks stunning! Here is a tour that includes Anse Marron to give you an idea of what you could be experiencing. 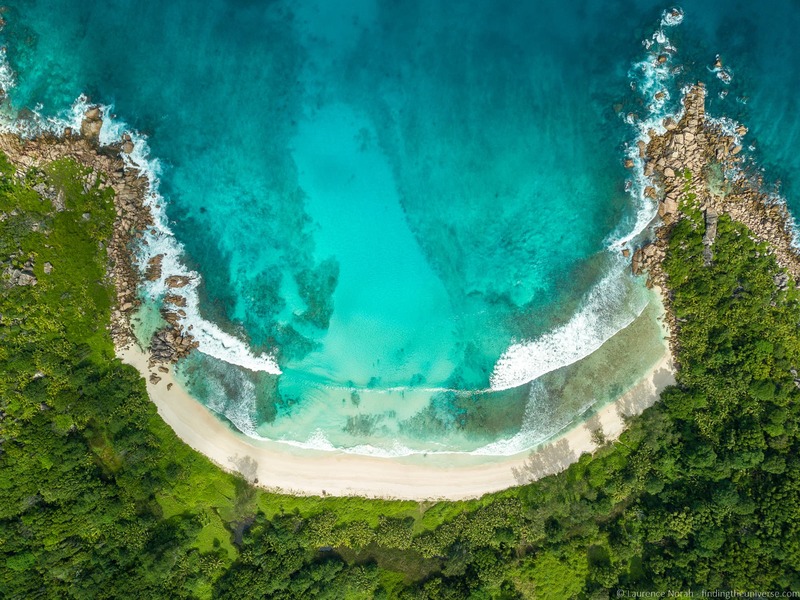 So by all means visit these incredible beaches, but do also spend some time exploring these islands and searching for your own personal favourite beach in the Seychelles. There’s no shortage of them! To help you plan your time in the Seychelles, we’ve put together this map which shows all the beaches we’ve mentioned. You can also see this on Google Maps here. All of the beaches in this post are on the three most visited islands in the Seychelles – Mahé, Praslin and La Digue. 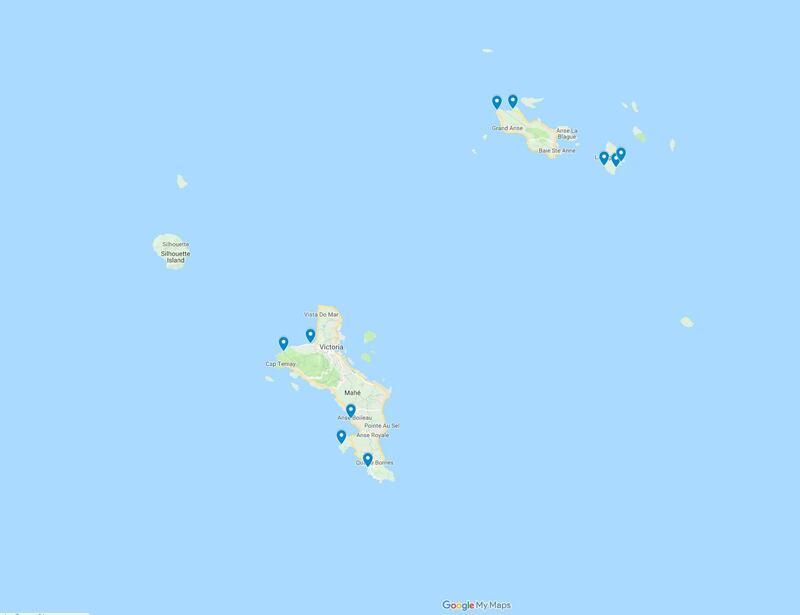 These are also the islands we feature in our 1 week Seychelles itinerary, and are the islands we recommend to the first time visitor who has around a week to spare. So this is where we will focus this accommodation guide. As you will see, the Seychelles has no shortage of accommodation options, although the majority of these options fall into the midrange through to luxury category. Hostel style accommodation options don’t really currently exist, and camping is illegal. If you are looking for lower priced or mid-range options, you will be pleased to hear that there are lots of AirBnB properties in the Seychelles (if you are new to Airbnb, get up to $100 off your first AirBnB booking with this link). There are also various self catering options that are well priced in the mid-range category, as well as a number of high end luxury properties on the islands. It’s worth being aware that the government are clamping down on unlicensed AirBnB properties in the Seychelles, and you’ll be asked for the address of your accommodation when you arrive at the airport. We were even asked for a phone number to verify where we were staying. So if you do book an AirBnB, make sure it is licensed, and that you know the address and owner contact details for when you arrive. When we visited the Seychelles most recently, we stayed at a mix of hotels and self-catering properties. 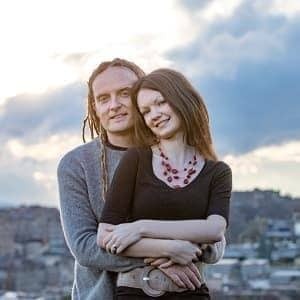 On Mahé, we spent a week at Villa Kordia. This is a nice self catering property located at Pointe Au Sel, around ten minutes from the airport and fifty metres from a beach. 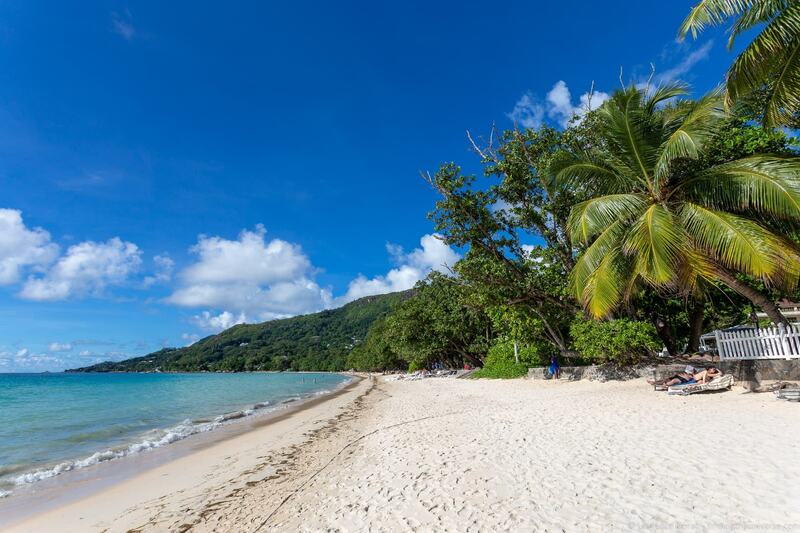 It’s handy for most of the beaches on the south of the island (about 15 minutes to Anse Intendance driving), and around 40 minutes to beaches like Beau Vallon. The owners here helped us to arrange our hire car, and they also offered the option to arrange meals, which is a fantastic way to sample the local Seychellois cuisine. On Praslin, we stayed at the Palm Beach Hotel, right on the beach and with wonderful sunset views. This is only a five minute drive from the Vallee du Mai, the main visitor attraction on the island. In terms of beaches, it about half an hours drive from here to Anse Lazio, and around 10 – 15 minutes to where you would park for Anse Georgette beach. Finally, on La Digue, we stayed at Oceane Self Catering. This was five minutes walk from the jetty, and we had a lovely big room with self catering facilities. They also offered bicycles rentals and meals in the evening, and the Creole food on offer here was excellent value and very authentic. From here, it’s around a fifteen minute bike ride to Anse Source D’Argent, and around twenty minutes over the hill to Grand Anse. If you’re looking for a bit of luxury, then you might consider the Four Seasons on Mahé, which is located on Petite Anse. Visitors to Praslin will likely want to consider the Raffles Hotel, which has its own beach, and just a ten minute drive to Anse Lazio. Both are gorgeous properties and staff were friendly at both properties when we visited. La Digue has less in terms of luxury properties, but you may want to consider either Domaine de L’Orangerie, or Le Nautique. Of course, there are lots of options when it comes to accommodation in the Seychelles. We usually advise looking on booking.com, as we find they have the best prices, most options, and they have everything from hotels through to apartments. You can see all their Seychelles options here, which you can then filter depending on the style and budget of accommodation you are after. By far the easiest way to get around the Seychelles is to hire a car. This will let you get to all the beaches we’ve listed with the minimal hassle. Driving in the Seychelles is quite easy, just remember that they drive on the left. Distances are not great and traffic is usually reasonable, with the exception of rush hour in the mornings and evenings on Mahé, when the east coast of the island especially gets quite busy as everyone is going to or leaving work. Car hire is widely available, and generally costs in the region of $50 – $80 USD a day. Many hotel operators can help you arrange a car, and there are also booths at the airport. The exception to the car hire rule is La Digue, where there are very few cars, and the preferred mode of transport is the bicycle. Bicycles are available for around 100 rupees a day, and most guesthouses or hotels will have bicycles available. Alternatively, there are multiple bicycle hire locations around the jetty area and these are easy to arrange. On Praslin and Mahé, there is also a public bus service. This is a lot cheaper than hiring a car, and buses run to pretty much everywhere, with the exception of the far flung remote beaches. Using the bus is just a case of standing at a bus stop and waving at the driver. Payment has to be made in cash, with the prices fixed at around 8 rupees per journey, regardless of distance. A bus is obviously a slower option compared to a car, but it is an option if you are on a tight budget. There are also taxis on both Mahé and La Digue, which will get you where you need to go, and private drivers can also be arranged through most of the luxury hotels as well. The standard for electricity in the Seychelles is a 240 volt supply, and plugs are three pin – the same as you find in the UK. Visitors from mainland Europe and much of the rest of the world will therefore need a travel adaptor like this. Note that travel adaptors do not convert voltage, so if you are coming from a country which has a 110v standard, like the USA, you will need to check that your electronic items are compatible. In our experience, things like laptops, camera and phone chargers are compatible with 110v – 240v supplies, whilst high power items like hairdryers or hair straighteners might not be. Voltage compatibility will usually be written on the device somewhere, often on the plug. Seychelles is a small island destination far away from any mainland, so internet access is relatively expensive. The good news is that most hotels and guesthouses do offer free WiFi internet access these days, which will be fine for e-mail, research and sharing photos, but will likely not be fast enough for video streaming or large file access. If you want internet on the go, it’s possible to pick up a SIM card if you have an unlocked device, and get data through one of the providers in the Seychelles. For an up to date list of prices and packages, check out this page which lists the best data sim packages for the Seychelles. We also have a guide to getting online when travelling, to help you figure out how to do that. 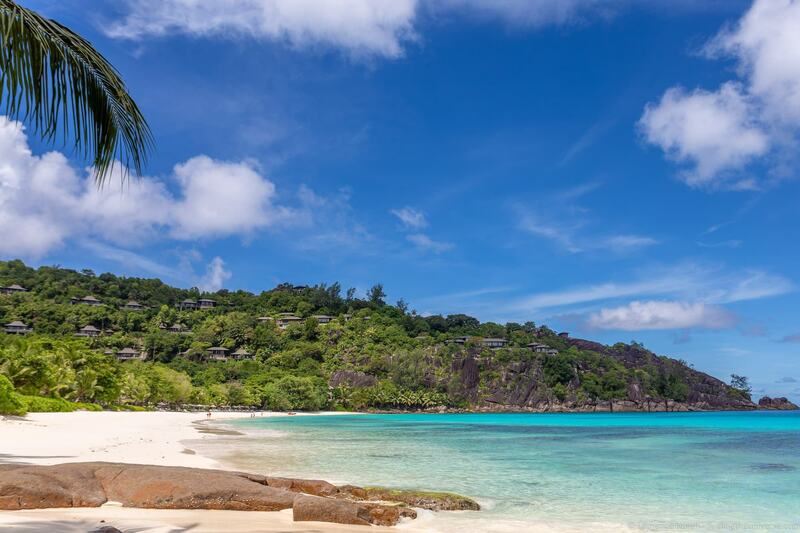 Whilst overall the Seychelles are a safe place to visit, with violent crime being uncommon, there has been a rise in petty theft incidents of late. This is particularly prevalent in tourist hotspots, such as beach parking lots, and on beaches themselves, where visitors might leave valuables unattended when going for a swim. We noticed that many of the more popular beaches in the Seychelles now have police officers or hotel security in attendance, and they warned us to be vigilant about our belongings, and not to leave valuables unattended. It’s also important not to leave valuables in cars, as these do get broken into. If staying in an apartment or vacation rental, be sure to close and lock shutters, windows, and doors when leaving for the day, and lock valuables in the provided safe if there is one. Overall, our advice would be to leave your valuables and important documents behind in your hotel room safe, and only take the essentials to the beach. If you take a camera, make sure you don’t leave it unattended on the beach. The main language in the Seychelles in Kreole, which is loosely based on French. You will generally find that most folks in the hospitality industry will speak both English and French, and some also speak some German and Italian. Most tours and guides speak English, Kreole, and French. But if you are traveling and need a tour or guide in another language, it might be a good idea to check ahead and make arrangements as needed. Well, that pretty much sums up our guide to the best Seychelles beaches! Hopefully you’ve found it helpful to picking the perfect Seychelles beach for your trip. And that’s it! We hope you enjoyed our Seychelles beach guide and as always, if you have any questions or feedback for us (maybe a favourite beach we missed? ), just let us know in the comments below!